Dark Sacrifice is the second of three in a series. I've reviewed the first book, Dark Paradise, here. Dark Sacrifice continues where Dark Paradise left off. I'm going to try to write this review the best I can to avoid spoilers from this book, but just know that if you haven't read Dark Paradise yet, there might be spoilers about the characters, plot points, and their relationships and abilities that you might not know! So if you are going to stop here, just know that you do need to read the books in order, I did enjoy this book even though it's a bit messy, and am looking forward to the third one. In Dark Sacrifice, Mala is learning more about her powers, how to use them, and their consequences. When the novel starts, she's locked up in the mental ward of the hospital due to her appearance of insanity at the end of Dark Paradise. She learns who her father is toward the beginning of the book, with very interesting implications. She's got a couple of new tricks up her sleeve that she can employ to help solve the ever deepening mystery around her mother's death. And let's not forget about Landry, the hot guy she is forever intertwined with, according to the "psychic" in the first novel. I thought it was a really interesting choice to have Mala seriously and permanently injure Landry in Dark Paradise. It adds a layer of depth to their relationship. This book was put out by a romance imprint, and there are definitely romance elements, but it doesn't overwhelm the book, and for that I am glad because strictly romance novels are not interesting to me. The romance between the two is only a part of Mala's larger coming-of-age story along with all the fantasy elements with paranormal activity and witches. It's a bit of a murder mystery and has strong Southern Gothic elements as well. Overall, the series has been really entertaining, and I actually keep thinking that this series and these characters would make a great new series for Lifetime, along the lines of Witches of East End but with more flavor. I didn't enjoy this book quite as much as the first one. 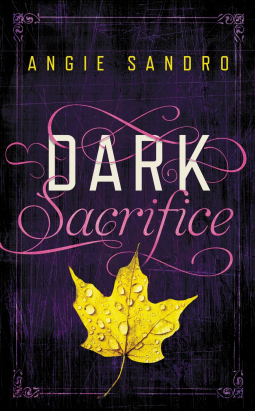 Dark Sacrifice suffers a little from second-book-syndrome, and I don't think it could stand alone very well, so I rated it as three stars on Goodreads, but it's three stars in a positive sense, like "worthwhile to read with some flaws." I did feel at times that the book took me places and I was confused about why we went there. Without giving away any spoilers, hopefully certain elements of the storyline will be fleshed out more in the third book, Dark Redemption, which will be coming out in September. Disclosure: This review contains Amazon affiliate links, where these novels are available in Kindle format at an extremely affordable price.